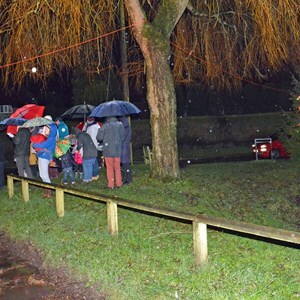 The tradition of singing Carols around the Pond was started on behalf of the Parish Council in 1971 by Geoff Rodges, a Parish and Borough Councillor, . 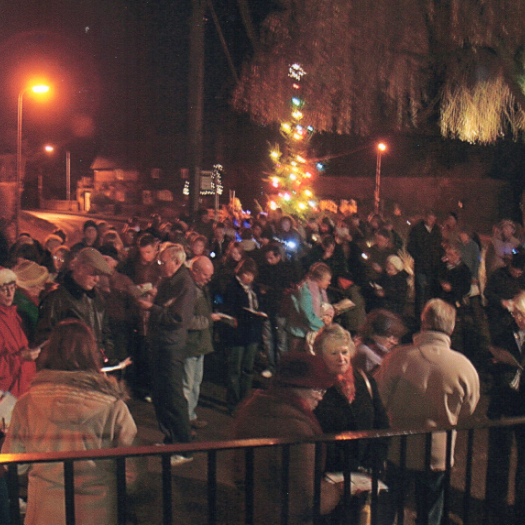 It was an opportunity for villagers, family and friends to get together at Christmas to sing all the traditional carols. Geoff with his fine voice also used to lead the singing of other Christmas songs. He led the singing every year until 1998 - except in 1983 when he was Mayor of Basingstoke and Deane and joined us as our guest. After Geoff retired, first Claude Pither and then Paul Connelly led the event until 2004 when George Elkin took over the reins. The singers have always been accompanied by an organist / pianist. For many years this was the organist at the Methodist Chapel but in more recent years other talented musicians play the music. 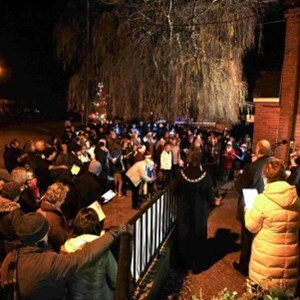 One tradition introduced by George Elkin, which is now a firm favourite, is to invite the youngsters present to come to the front of the crowd to sing the first verse of ‘Away in a Manger’. 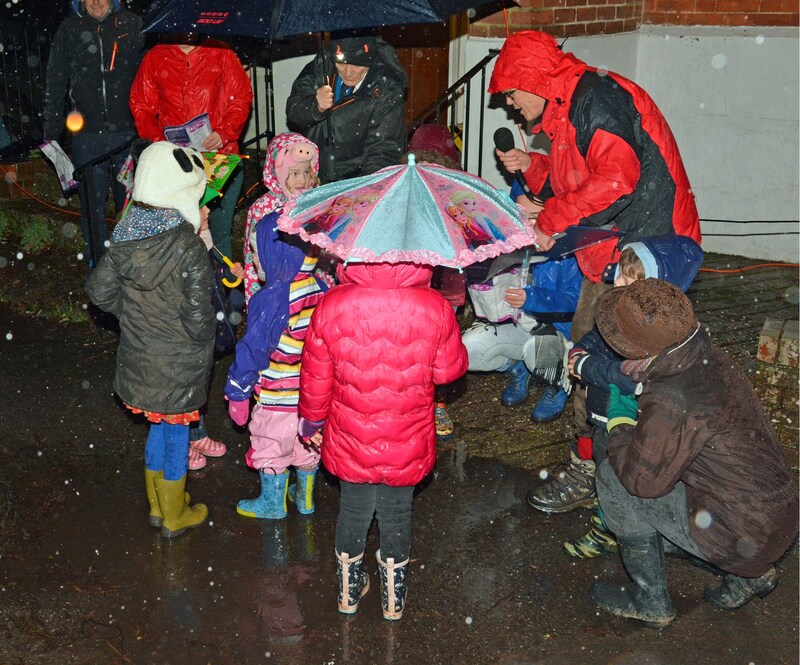 After the carols, tea and coffee is provided in the Methodist Chapel where, in a few very wet years the crowd assembled. 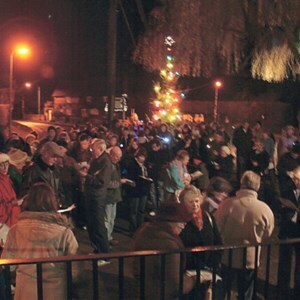 It’s never a popular decision to move inside as most people prefer to brave the elements around the lights of the tree. 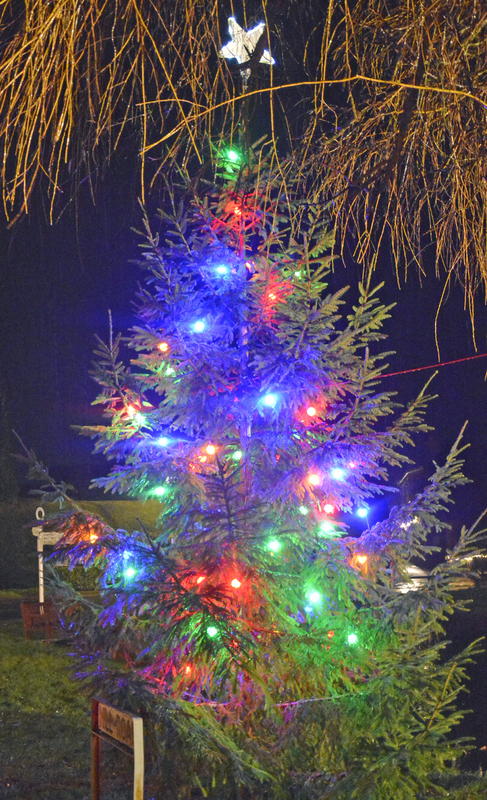 The Methodist Chapel has not only provided a roof over our heads but has also supplied the electricity for the Christmas tree lights - for which the Parish Council is very grateful. We have had the pleasure of the Mayor joining us every year and on a number of occasions our Member of Parliament. They are always pleased to see so many gathered round the Christmas tree and singing so well. 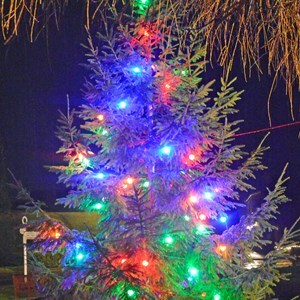 After a few years it was decided to erect a Christmas tree with lights and the first one was put up in the mid-seventies. The tree was provided by the Malshanger Estate at no cost, as has every tree since. When the erection team used to have full time jobs it was delivered the night before it was put up on Saturday. One Saturday the team arrived to find that someone had cut the top six feet off to take home. 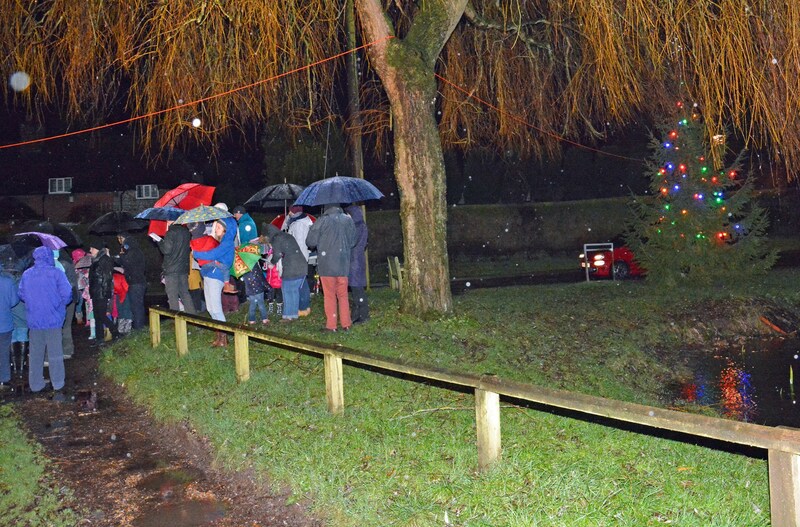 A phone call from the Parish Clerk to the Estate Office saved the day and a new tree was delivered in time for the event. 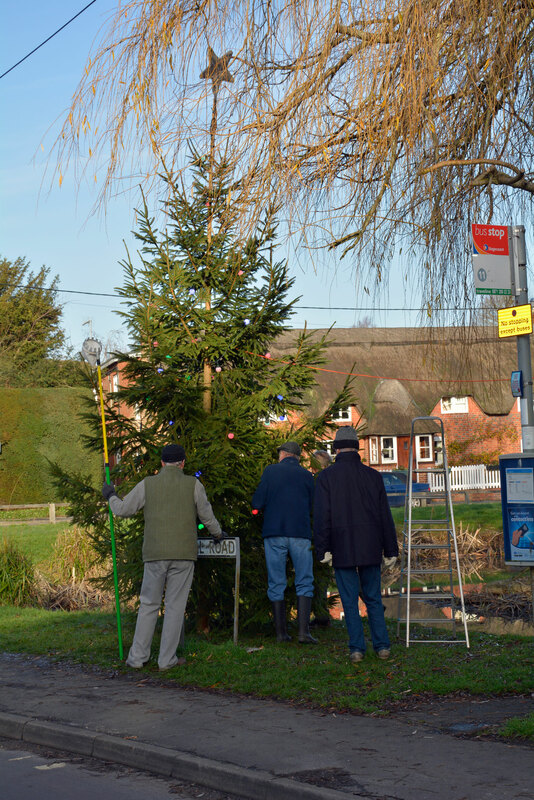 It is now delivered to the pond on the Tuesday morning prior to the carols and erected that morning. The tree is placed in a secret hole, the location of which is only known by the erection team leader. We are currently using the third hole because as the willow tree grew the hole had to be moved further away from the Chapel. Until this year there has been only one team leader, but after 42 years another member of the team has taken over. 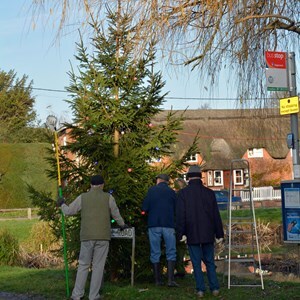 The team was, until recently, mainly members of the Parish Council with a few friends but now the majority are Adhoc members who put up the tree and the lights. Each year a collection is taken by members of the Parish Council - traditionally using an old, clean, sock as the receptacle. 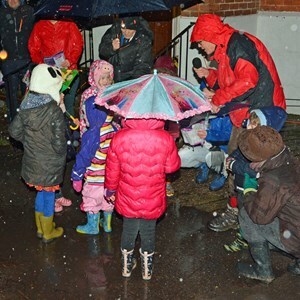 Those present at the carols have always been very generous in giving (in the region of £200 each year) and as a result many in the village have benefited. Originally the money was used to sweep the chimneys of pensioners, many of whom could not afford to have this done, but with the replacement of open coal fires with central heating the need ended. Now the money is given to local organisations including the Scouts and Guides Premises Committee, Gap - the youth group held at St Leonard’s Centre, Oakley First Responders, Oakley Village Hall and in 2018 to the newly formed Oakley Mens Shed.